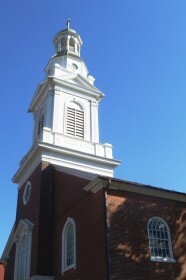 St John's Evangelical Lutheran Church – Lifting high the cross in historic downtown Easton since 1740. St John’s Lutheran Church at 330 Ferry Street is a friendly, welcoming congregation in historic downtown Easton. Sunday school is at 9:00 AM (breakfast served beginning at 8:15 AM) and worship is at 10:30 AM. As a community of God striving to be open to all people, we at St John’s Lutheran believe that the gospel is God’s gift to all people, to be shared unconditionally. We welcome all to join us as we struggle to better understand the mysteries of God’s teachings. We are challenged by Christ to care for, to love, to understand, and to listen to each other, regardless of race, age, gender, marital status, physical and mental abilities, sexual/affectional orientation, national origin or economic status. We celebrate together our unity as God’s people. St John’s Lutheran Congregation is a place for each person to shine in their own unique gifts. Join us. You are welcome!